Amit Shah, an old friend and a close aide to Gujarat C.M. Narendra Modi made a dramatic entry into the BJP office in Ahmedabad at 11.35 am and angrily denied the charges that he was involved in the 2005 killing of Sohrabuddin Sheikh, an alleged Lakshar-e-Taiba activist. He tried to put up a bold posture and made a detailed defense of his case before the gaggle of journalists and then he drove to the CBI camp office in the state capital Gandhinagar, of course accompanied by a large contingent of supporters. As expeccted the CBI formally arrested him, the process lasting only a few minutes. He was driven back to Ahmedabad where he was taken to the house of CBI judge AY Dave. Dave ordered Shah’s judicial custody for 14 days as a large number of BJP activists ringed his house shouting slogans hailing the man who quit as minister Saturday amid a hunt for him. One chapter in the life of this flamboyant politician closed that moment – another opened. No one was surprised when the man who had put the Constitution of Indian on the back of elephant and paraded it on the streets of Gujarat only few months ago was heard and seen making a mockery of CBI’s inquiry and ultimately the Supreme Court that had ordered that. 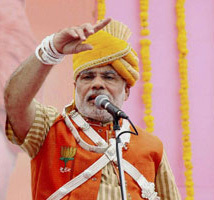 Attacking the Congress, Modi said, “The case against Shah was a revenge for its loss in the 2 007 Assembly polls when it had made Sohrabuddin a hero. This was a politically motivated action against Amit Shah and the BJP government in Gujarat to corner it and to put obstacles in development work it was carrying out. Shah is completely innocent and the charges against him are fabricated. The CBI is being misused by the Congress against its political rival”. Sunday’s developments marked a new turn in the case of Sohrabuddin Sheikh that has led to the arrest and jailing of 15 police officers including three from the Indian Police Service. Here you are listening a Chief Minister who is supposed to defend the Judicial System of Democratic Indian and rule of law. Before any the results of an inquiry is made public or the Court gives its judgments a senior leader like Advani approached the government to derail the functions of CBI while Naredra Modi throws his judgment in a matter which is absolutely out of his purview. We don’t know for sure about the background of Sohrabuddin and his luckless wife but one thing is sure that if have that kind of leaders at the helm of affairs, tomorrow it can be us and our own daughters and sons. We are witnessing ministers operating beyond certain powers and becoming thoroughly corrupt. They can go to any extent and in any business over time. Let us know who is this Amit Shah. He is an Ahmedabad-based leader of BJP who has been handling senior leader L K Advani’s elections year after year in Gandhinagar constituency. He is an important member of the inner circle of Chief Minister Narendra Modi. He was a stock broker before he turned fulltime politician and a veteran of co-operative banks in Ahmedabad. He is known for his arrogance and he had rarely entertained reporters. He never gave regular briefings and often treated the media with disdain. Modi several victories went to his head also and he started believing that Modi and their government had absolute power. The abuse of power starts when political success comes easy in the absence of substantial opposition. In Gujarat religious elements are indistinguishable from the government. Police stations and panchayat buildings are sponsored by private companies and are fitted with marbles and pictures of Hindu gods and goddesses. Shah has been the prime inspiration behind this mixing the State and the Church. Today this product of RSS has to face some 20 evidences against him in the chargesheet and some are likely to stand in a court of law. There are some businessmen who have given evidence that Shah demanded money from them after the fake encounter of Sohrabuddin. Some businessmen have alleged that Shah told them that during the police inquiry into Sohrabuddin’s activities, their names were linked with his operations. They allege that they paid Shah to remain out of the investigation. Also, how the Sohrabuddin’s wife Kausarbi was murdered is a larger than life crime against this extremely religious man. Shah will surely fight the case to prove his innocence because he will have to shield his boss too, who was and still running the show when this case took shape. The turning point came for Shah when, under legal advice from senior lawyers, the Gujarat government accepted before the Supreme Court that the Sohrabuddin encounter was fake. It was unprecedented. Modi’s and Shah’s political strategy seems to work at naught now. Wheel of natural justice seems to have taken the full circle. His arrogance due to political success and his miscalculation about the functioning of bureaucracy are coming home to roost. Life, henceforth is not all cake and ale now. Perhaps he had underestimated the power of men and women in khaki and his total lack of judgment about the Supreme Court’s influence over the cases before it has led him to his fall. It is time Supreme court gives the maximum sentence and deter any politician to cross the holy line of our constitution for next 500 years.